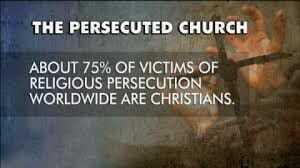 If you are a committed Christian, you will be persecuted. Prompt: Has anyone ever reacted negatively to your faith in Christ? 1. What image comes to mind when you hear the word persecuted? According to Matthew 5:11, how might that definition be broadened? 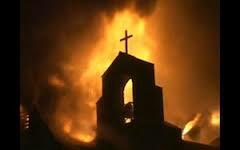 Is persecution an isolated event or something Christians should avoid? See 2 Timothy 3:12. 2. We often think of persecution happening only when someone admits they are a Christian in a country predominated by other religions or atheism. What does the phrase, “persecuted because of righteousness” mean? List several ways someone might be reviled, threatened or ostracized because of righteous choices? 3. What keeps you from sharing your faith with non-believers, stating a biblical point of view, or making a righteous choice that swims against the tide of public opinion? According to Matthew 5;12 what should be your response? 4. Why would Jesus tell his followers to be glad about persecution? What is His reason in Matthew 5:12? See also John 15:20. What’s the connection? 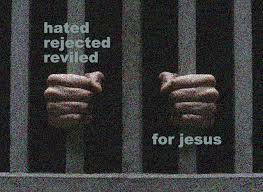 If you are persecuted, what does that say about you and your commitment to Jesus? 1. What Scriptures or faith concepts bolster you when you’ve been attacked for your faith or Christian response? 2. We are in this together! If one part of the body is being persecuted, we are all under fire. How can you encourage, help, or pray for someone who is under attack for their faith or their display of righteousness? List three or four ways. FURTHER READING: How are Christians able to rejoice and be exceedingly glad when they are persecuted? For an insightful look at the persecuted church, you might want to read The Insanity of God by Nik Ripken and Gregg Lewis. This concludes the Be-Attitudes bible study. For seven weeks, I’ll be providing a bible study guide sheet based on Max Lucado’s book, Grace: More Than We Deserve, Greater Than We Imagine. If you were to design a picture of peace, what would it look like? 1. Why would Jesus consider peacemaking an important attribute of those who would follow him? 2. Romans 5:1 says, “Therefore, having been justified by faith, we have peace with God through our Lord Jesus Christ.” What kind of peace does God offer through Jesus? How has God brought you peace? 3. Read our key verse. Notice the verse does not say, “Blessed are the peacekeepers” or “Blessed are the peace maintainers.” The Greek word for peacemakers means people who are founders and promoters of peace, people who seek to bring men in harmony with each other. Describe a time when you or someone tried to create a peaceful environment. What did the person do that brought peace into the situation? What did the person say? 4. Read Mt 10:34-36. 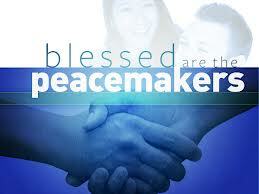 If Jesus called us to be peacemakers, why does He say that He came to bring peace but a sword? 5. Is making peace entirely up to you? See Romans 12:18. What stands out in this verse to you? What actions can you do that will bring peace to those around you? 6. How does sharing our faith in Christ and living a godly life bring peace to other people? See Isaiah 52:7. 7. What will happen when we work toward creating godly pockets of peace wherever we are? See James 3:18. Where in your corner of the world do you see conflict and disharmony? How can you “make peace?” What might you say? What can you do? How will you react? Choose a group of people or a situation where conflict or a lack of harmonious living exists. Choose one day this week where you will determine to “live at peace.” Pray that God will empower you to be an ambassador of peace to those around. Submit yourself to be used by God to be His brand of peacemaker. Who should we show mercy to? And why was it so important to Jesus? How do we show mercy without enabling sinful behavior? Prompt: Think about a time when someone showed you mercy. According to Vine’s Expository Dictionary of New Testament Words, merciful means actively compassionate; a show of sympathy to those in distress or misery. 2. After Jesus told his parable of the Good Samaritan in Luke 10:25-37, he asked the law expert who was the neighbor in the story. The law expert answered, “The one who showed mercy.” How did the Samaritan demonstrate mercy in this story? 3. Jesus said we are blessed when we are merciful because God will show us mercy. Jesus echoes this reciprocal condition in other places. See Mt 6:14, Luke 6:38, and Eph. 4:32. Why does Jesus put this condition on His mercy to us? 4. Jesus’ audience had lived under a strict code of law. They also believed that those who were sick, crippled, or in dire straits were in that position because of sin. Why might Jesus’ listeners have a hard time accepting Jesus’ comments about mercy? 5. Do you find it difficult to show mercy? When? To Whom? Why? How does one balance wisdom and discernment with mercy? Think about Mt 10:16 and James 2:12,13.
Who is facing a difficult time or struggling with life circumstances in your circle of influence? Write down three ways you can show mercy to that person. Choose one to do this week. 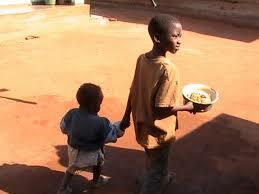 When were you the most hungry or thirsty? What did you do about it? 1. What other Bible verses or stories can you think of that talk about craving God or longing to follow His ways? For starters, see Ps 42:1,2 and John 4:1-13. Why does the Bible compare our longing for God to the longing for food or drink? 2. How is the idea of hungering for righteousness or seeking God a radical idea in religion? How do most people view the concept of living a righteous life? 3. Craving God is one of several images the Bible uses to describe our inner attitude toward a relationship with God. Another is that is that of seeking God in the same way we would look for a lost item. See Deuteronomy 4:29, Proverbs 8:17, Mt 7:8, 13:44-46, Luke 15:1-10. What is the difference between the image of hungering and the image of seeking? Why does God want us to seek him with all of our heart? 4.When we long to know the right thing to do, what does the Bible tell us we can do about it? See James 1:5,6. 5. According to our key verse and many of these other verses, what will happen when we long for and search for God? How is this reassuring to you? b. I’m satisfied with a little bit. A little dab will do me. 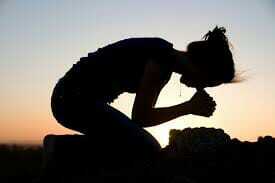 c. knowing and understanding God is the primary focus of my life. How satisfied are you with your current relationship with God? Jesus says if you aren’t satisfied, then you are exactly where you need to be! What do you plan to do this week in order to know God better and follow Him more closely? What do you need to let go of or give up? How has this study encouraged you and helped you so far? Tell us your thoughts!